Kenzie received the Luv Chicken Booster seat for review and it is just so versatile. 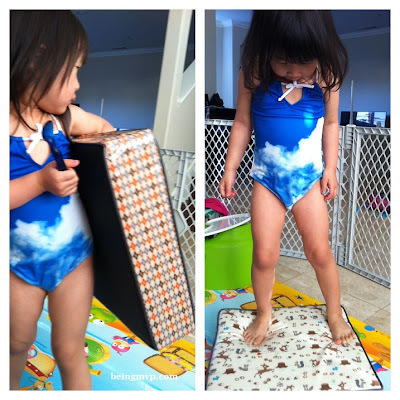 It is a large square cushion covered in a kid-safe coated fabric that is easy to wipe clean with a non-slip bottom. The Woodland Friends print is whimsical yet chic. Kenzie was all over it when it arrived and when I told her it was her booster cushion, she got all giddy. Kenzie is beyond the highchair stage (although she does want to hop into Mason's once in a while) but not quite big enough to reach the dining table when sitting flat on the chair. When we are at the table and Kenzie is in her chair, she usually sits on her knees or squats. Since she doesn't sit still for an entire meal and hops off to go play or stands on the chair (which I constantly have to tell her to stop doing for fear of her falling), I was hopeful that the Luv Chicken Booster would help. This booster seat fits perfectly on our Crate & Barrel dining chairs and when I placed Kenzie on top, she easily reached her meal with no contortions. This is perfect for children 18 months to 8 years old. I'm sure Kenzie will be using it far longer than Mason as he is meatier than her. The handle on the side of this lightweight cushion allows for Kenzie to carry it on her own around the house and out and about. This toddler booster is versatile as it can be used on the floor as extra seating, climbing obstacle for crawlers, beds for dolls, surfing and more. I love that it is easily cleaned as I am all over spills and messes. This would make a perfect gift for a 1st birthday. Buy It: You can purchase the Luv Chicken Booster Seat for $45. Make sure to connect with Luv Chicken on Facebook and Twitter! I LOVE their fabric options! Gorgeous! This would be perfect for my grandson! He's old enough to not be strapped in a seat anymore, but too short to reach his plate good to eat. This would be perfect for my son his is 3 and kind of in between. Wow that would be so useful in our home. 6 of my eight granddaughters could really use this. Thanks for sharing. i love the cushion! seems much more comfy than a plastic booster!